Civil Services Examination is one of the most competitive and prestigious exam, popularly known as IAS is conducted by UPSC to recruit candidates for Indian Administrative Service, Indian Foreign Service, Indian Police Service and several other Group 'A' and Group 'B' Central Services/ Posts. Civil Services offers premier job opportunities and challenging career. The selected candidates plays a major role in managing the bureaucracy of both the central and the state governments, holding strategic posts across the country. These candidates recruited as officers are involved in various responsibilities like framing of the policies, implementation, law and order, general administration, development of new projects etc. These officers will get a chance to work as authoritative posts like Sub-Divisional Magistrate, District Magistrate, Divisional Commissioner, Principal Secretaries/Financial Commissioners, Chief Secretary of state or central government. The Department of Personnel and Training (DoPT), under Ministry of Personnel, Public Grievances & Pension, is the cadre controlling authority. Civil Services examination is conducted for the recruitment of below mentioned services. All appointments to Civil Services are made by the President of India. Civil Services examination is a single window entry for various Group A and Group B services. These services/posts will be allotted as per the ranking. 1. For the Indian Administrative Service and the Indian Police Service, a candidate must be a citizen of India. e. a person of Indian origin who has migrated from Pakistan, Burma, Sri Lanka, East African countries of Kenya, Uganda, United Republic of Tanzania, Zambia, Malawi, Zaire, Ethiopia and Vietnam with the intention of permanently settling in India. Provided that a candidate belonging to categories b, c, d, e shall be a person in whose favor a certificate of eligibility has been issued by the government of India. Provided further that candidates belonging to categories b, c, d above will not be eligible for appointment to the Indian Foreign Service. A candidate in whose case a certificate of eligibility is necessary, may be admitted to the examination but the offer of appointment may be given only after the necessary eligibility certificate has been issued to him/her by the government of India. Candidates who have appeared at an examination the passing of which would render them educationally qualified for the Commission’s examination but have not been informed of the results as also the candidates who intend to appear at such a qualifying examination will also be eligible for admission to the Preliminary Examination. All candidates who are declared qualified by the Commission for taking the Civil Services (Main) Examination will be required to produce proof of passing the requisite examination with their application for the Main Examination failing which such candidates will not be admitted to the Main Examination. Candidates possessing professional and technical qualifications which are recognised by the Government as equivalent to professional and technical degree would also be eligible for admission to the examination. Candidates who have passed the final professional M.B.B.S. or any other Medical Examination but have not completed their internship by the time of submission of their applications for the Civil Services (Main) Examination, will be provisionally admitted to the Examination provided they submit along with their application a copy of certificate from the concerned authority of the University/Institution that they had passed the requisite final professional medical examination. In such cases, the candidates will be required to produce at the time of their interview original Degree or a certificate from the concerned competent authority of the University/Institution that they had completed all requirements (including completion of internship) for the award of the Degree. A candidate must have attained the age of 21 years. An attempt at a preliminary examination shall be deemed to be an attempt for the Civil Services examination. Notwithstanding the disqualification/cancellation of a candidate of his/her candidature, the fact of appearance of the candidate at the examination will count as an attempt. Question paper is set in English and Hindi. If you apply online but remain absent in prelims, then your attempt is NOT counted. Paper-I GeneralStudies Objective 2 Hours 100 200 1/3 of Marks allotted to the ques. Paper-II CSAT Objective 2 Hours 80 200 1/3 of Marks allotted to the ques. NOTE 1: 33% marks are the minimum qualifying marks for paper-II. NOTE 2: Preliminary examination will be conducted for screening purpose only. Only those candidates who qualify preliminary examination will be eligible for main examination. Main Examination is a written type of examination conducted in IX papers. Out of those IX papers marks obtained by a candidate in I to VII papers i.e of Four papers of General Studies, Two papers of optional and an essay paper will be counted for merit. Language papers are of Qualifying Nature. Interview according to UPSC is described to be a test of candidate’s overall personality which includes analytical ability, lateral thinking, logical decision making etc. The objective of the interview is to assess the personal suitability of the candidate for a career in public service by a board of competent and unbiased observers. 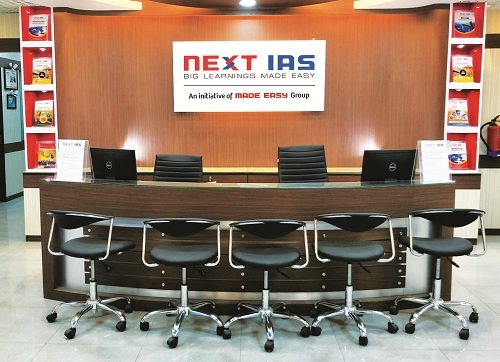 NEXT IAS, an initiative of MADE EASY Group, under the tutelage of Mr. B. Singh renowned educationist and founder of MADE EASY Group, has successfully transformed many candidates into future bureaucrats of the country. NEXT IAS provides Classroom programme, Online/Live Classes, Online/Offline test series, Postal Study Package, Interview Guidance Program. We offer the courses for GS, Essay, CSAT and Optional Subjects.